I've been drinking coffee for about 20 years and by no means consider myself a coffee connoisseur, but my taste in coffee has grown and evolved in all of the years. I've learned exactly what I like and I tend to stick to the same brand and flavors. I'm definitely hooked on the higher quality coffees now, and was excited when I was contacted to try out some NEW Gevalia Kaffee. Gevalia has been refining coffee since 1853, finding and blending the best Arabica beans from all over the world! Gevalia can now be bought at Safeway stores. Previously, Gevalia Kaffee was only available online but now you can get their top ten flavors in grocery stores, including roast and ground, whole bean, flavored and decaffeinated varieties. Gevalia Traditional Roast provides a perfectly balanced taste every time. Our most beloved blend - made of choice, mountain-grown Arabica beans - this coffee has a distinctive body and flavor with a lighter intensity. (Medium Roast). A Gevalia favorite, House Blend is a robust yet never bitter coffee. This roast has a captivating aroma that is only matched by its exceptional flavor. (Medium/Dark Roast). Delivering the same rich, never bitter flavor, House Blend Decaf has the same robust taste without all the caffeine. (Medium/Dark Roast). Gevalia French Roast is a coffee of impressive richness and dimension, expertly crafted from prized Arabica beans grown in Colombia and Brazil. Hints of aromatic smoke give this dark-roasted French Roast blend an intense, yet uniquely satisfying flavor. (Dark Roast). Grown high in the Colombian Andes, these beans produce a rich, bright and well-bodied Colombian coffee. This single origin classic is world-renowned, which is why we have sourced these beans for decades. (Medium Roast). Gevalia Espresso Roast is made of premium, mountain-grown Arabica beans from East Africa and Central and South America. This roast is bold and full-bodied with a hint of caramel undertones. (Dark Roast). This rich blend with vanilla flavor notes is crafted from choice mountain-grown Arabica beans, then roasted for exceptional body and flavor. Gevalia Vanilla is a flavorful and balanced experience with a heavenly aroma. Gevalia Chocolate Mocha allows you to indulge your passion for decadent flavor. Rich, velvety chocolate flavor is blended with mountain-grown Arabica beans for a sweetly satisfying experience. 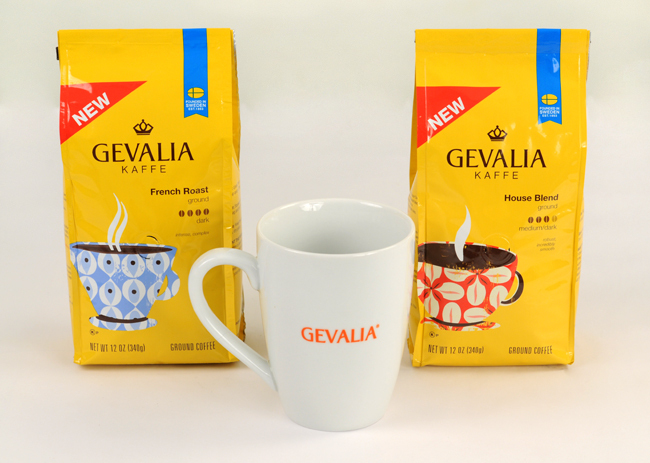 With its Swedish heritage and rich, never bitter taste, Gevalia is a premium coffee unlike any other. Having Gevalia in your kitchen means you care about the quality of the coffee you consume and enjoy rich, authentic flavors. Gevalia offers a variety of authentic rich flavors that are perfect for everything from a relaxing morning cup of coffee to an indulgent after dinner compliment. Gevalia Kaffee is rich and flavorful, my personal favorite being the French Roast. I love bold coffee, specifically French Roast by any brand, and Gevalia's is spectacular! I love to add some Vanilla creamer to my coffee, and I can truly imagine being in France enjoying my cup of coffee! Connect with Gevalia Kaffee on Facebook and stay up to date on their products! I've decided to start using Rafflecopter, and this is my first Rafflecopter giveaway! One winner will win a prize pack containing the same items I received (1 sample of the House Blend flavor, one sample of the French Roast flavor, and a Gevalia branded coffee mug), which is shown below. To enter, use the Rafflecopter widget below. View my Giveaway Rules, updated 5/12/10. Disclaimer: Kraft Foods has provided sample product to me and is providing the prizes for this program at no cost to me, and MyBlogSpark shared the information about this product. This program is not administered or sponsored by Kraft Foods or its affiliates, but solely by A Simple Kinda Life. I would love to try the Traditional Roast. I'm that kind of woman.